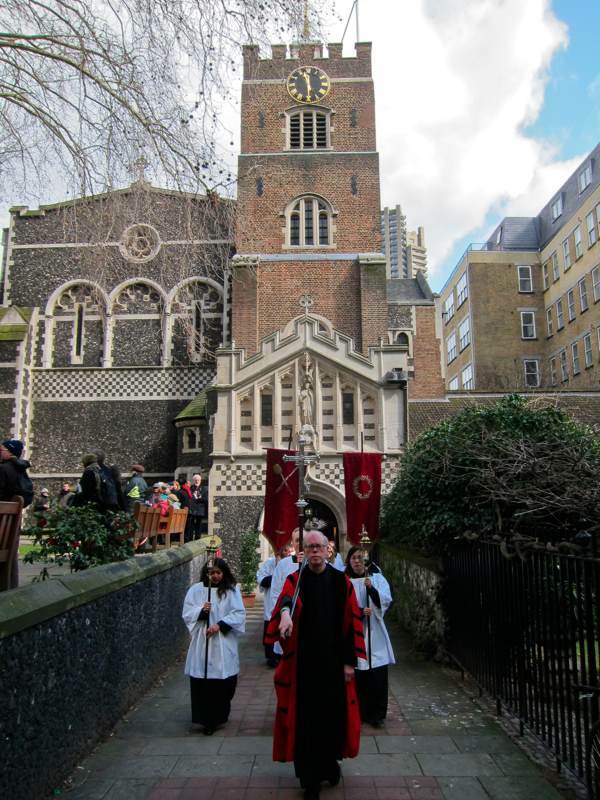 To get everyone in the mood for the forthcoming Easter celebrations, I am publishing my account of the Ceremony of the Widow’s Sixpence held each Good Friday when Hot Cross Buns are distributed to widows in the churchyard of St Bartholomew the Great in Smithfield. 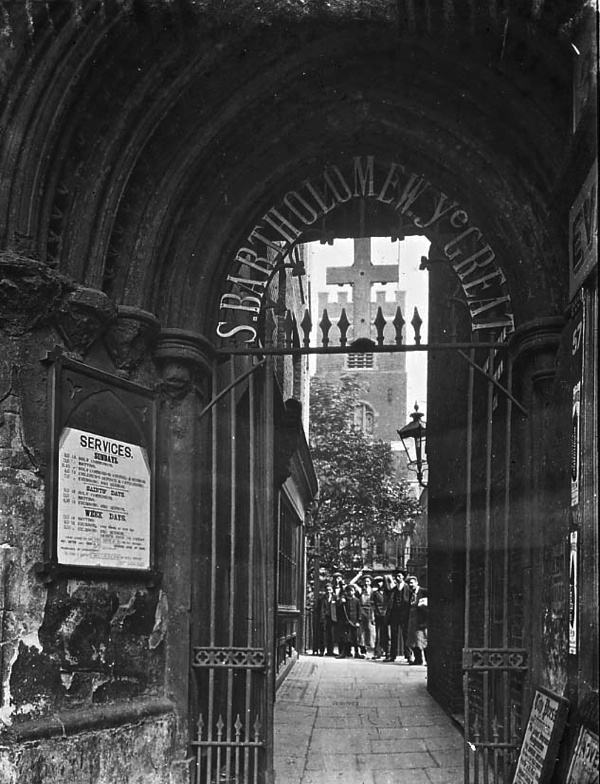 St Bartholomew the Great is one of my favourite churches in the City, a rare survivor of the Great Fire, it boasts the best Norman interior in London. Composed of ancient rough-hewn stonework, riven with deep shadow where feint daylight barely illuminates the accumulated dust of ages, this is one of those rare atmospheric places where you can still get a sense of the medieval world glimmering. 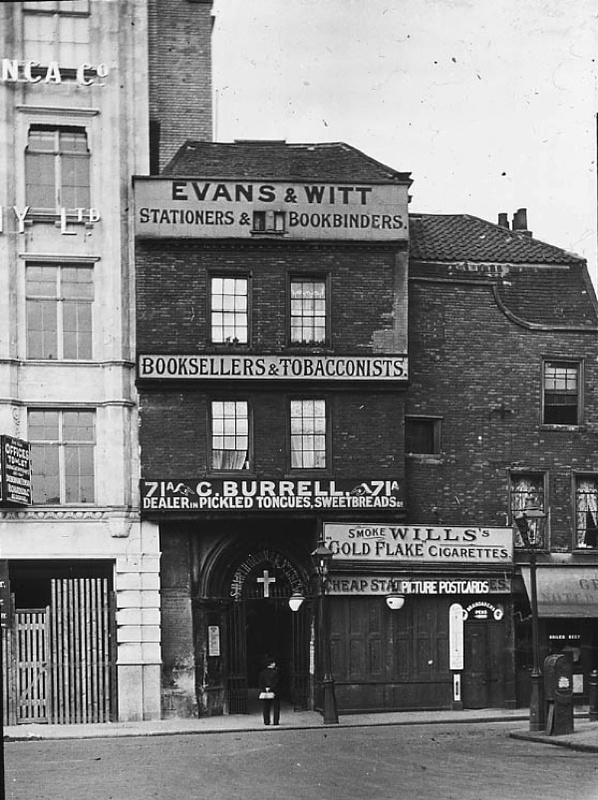 Founded by Rahere in 1123, the current structure is the last vestige of an Augustinian Priory upon the edge of Smithfield, where once martyrs were burnt at the stake as public entertainment and the notorious St Bartholomew Fair was celebrated each summer from 1133 until 1855. 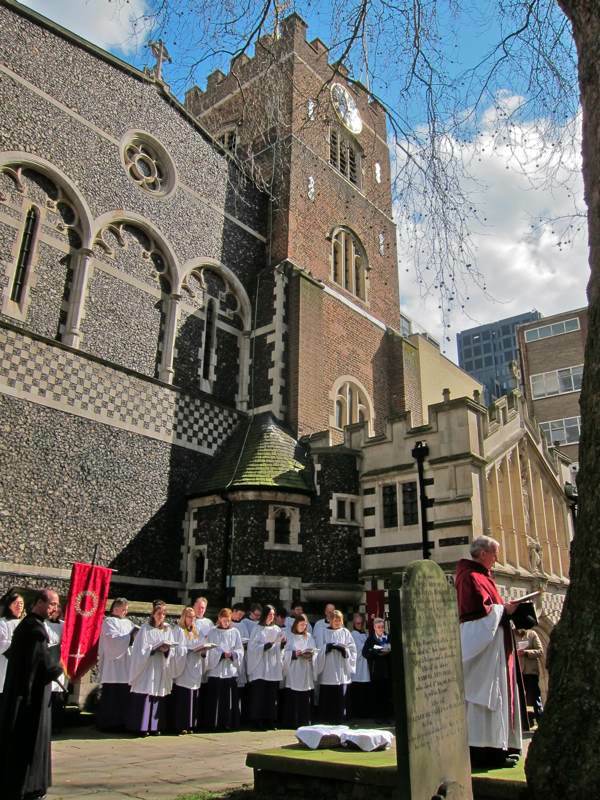 Those of use who gathered at St Bartholomew the Great on Good Friday morning were blessed with sunlight to ameliorate the chill as we shivered in the churchyard. 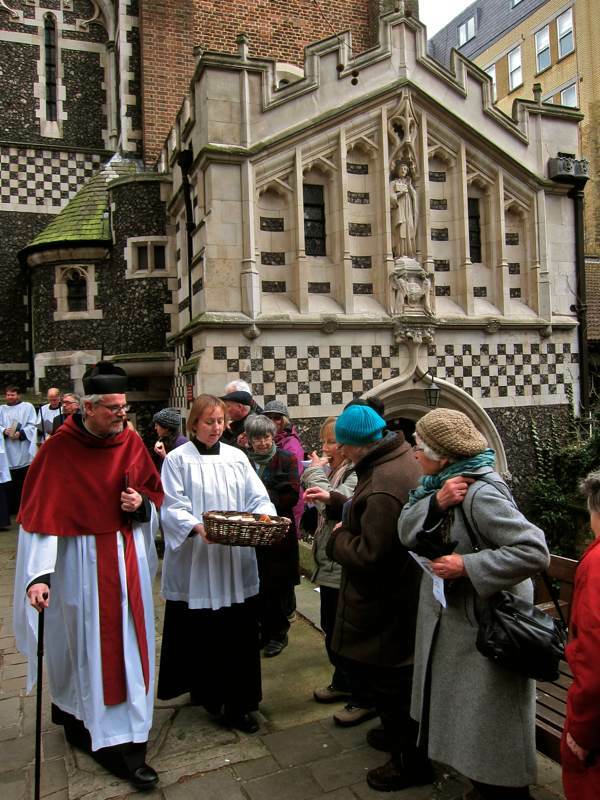 Yet we could not resist a twinge of envy for the clerics in their heavy cassocks and warm velvet capes as they processed from the church in a formal column, with priests at the head attended by vergers bearing wicker baskets of freshly buttered Hot Cross Buns, and a full choir bringing up the rear. 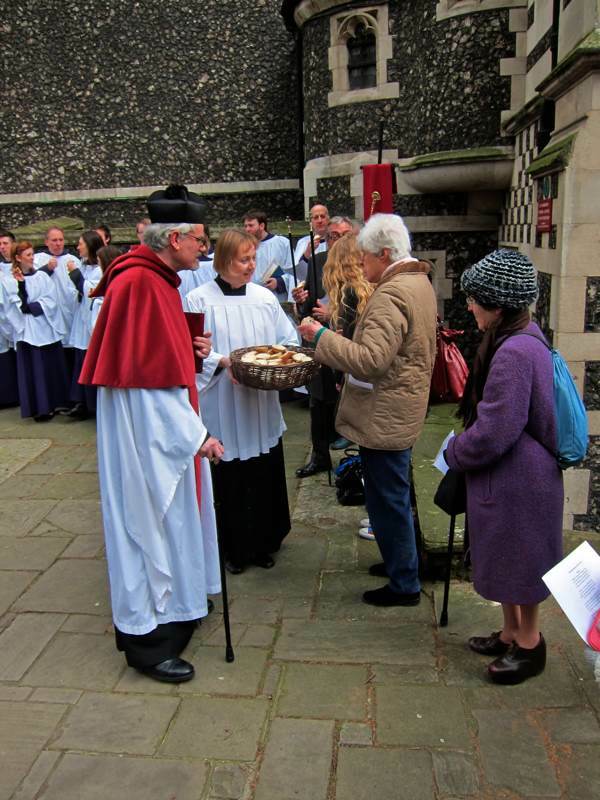 I detected a certain haste to get to the heart of the proceedings – the distribution of the Hot Cross Buns. 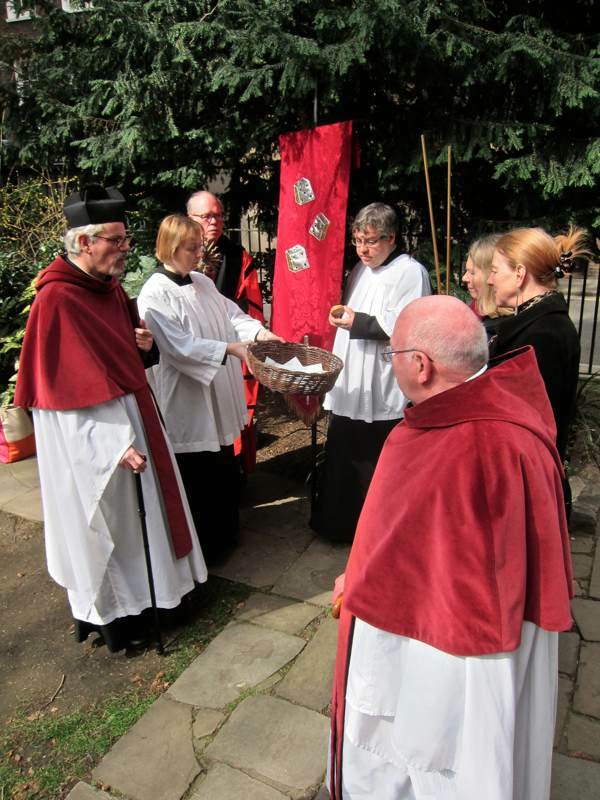 Rev Dudley directed the vergers to start with choir who exercised admirable self-control in only taking one each. 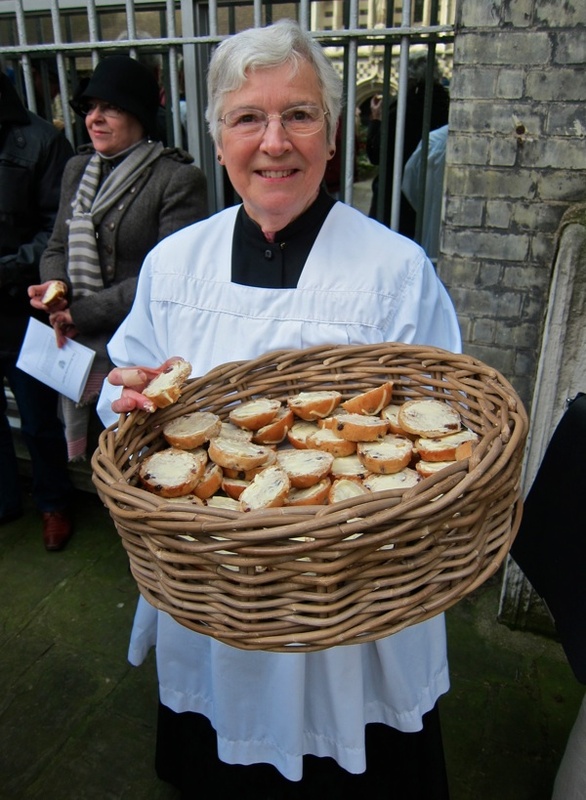 Then, as soon as the choir had been fed, the vergers set out around the boundaries of the yard where senior females with healthy appetites, induced by waiting in the cold, reached forward eagerly to take their allotted Hot Cross Buns in hand. 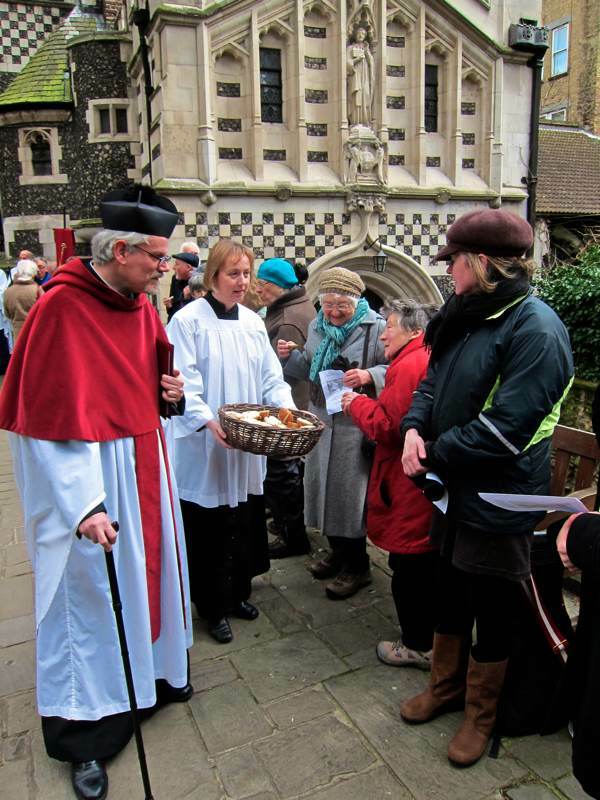 The tense anticipation induced by the freezing temperature gave way to good humour as everyone delighted in the strangeness of the ritual which rendered ordinary buns exotic. 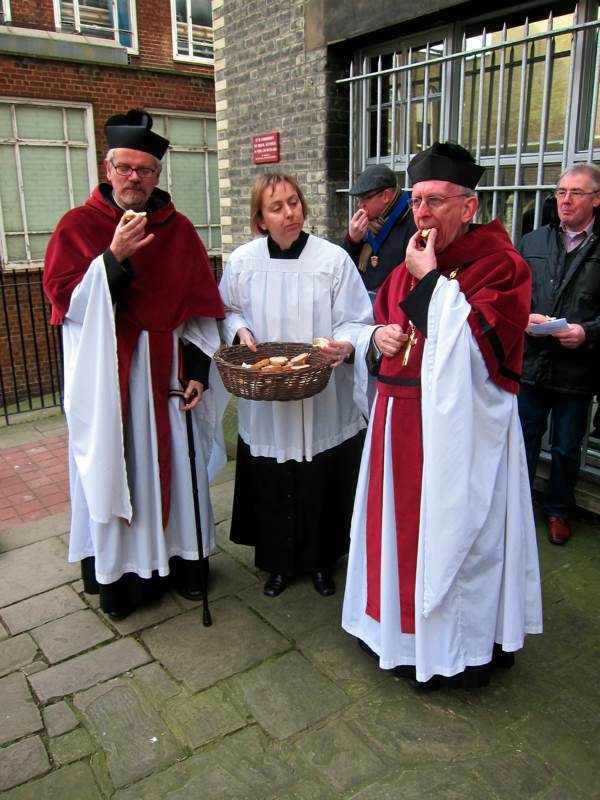 Reaching the end of the line at the furthest extent of the churchyard, the priests wasted no time in satisfying their own appetites and, for a few minutes, silence prevailed as the entire assembly munched their buns. 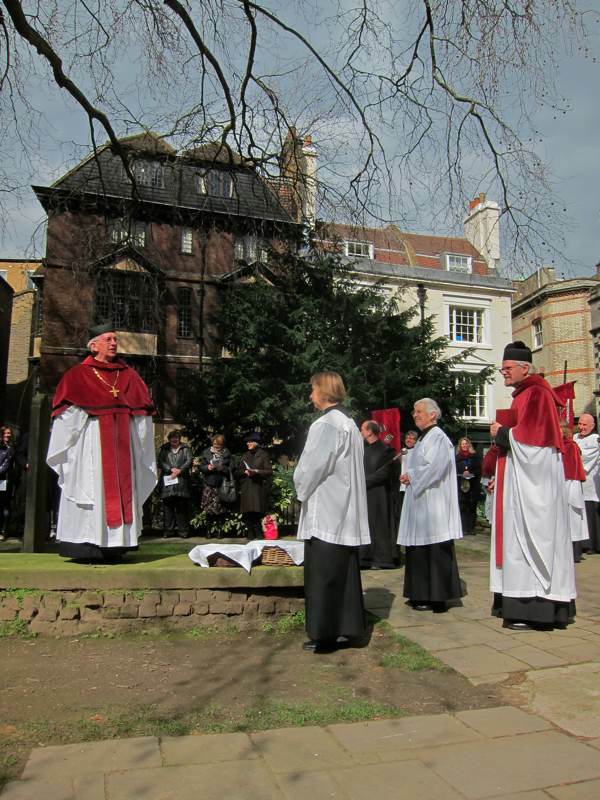 Then Rev Martin returned to his central position upon the table tomb. 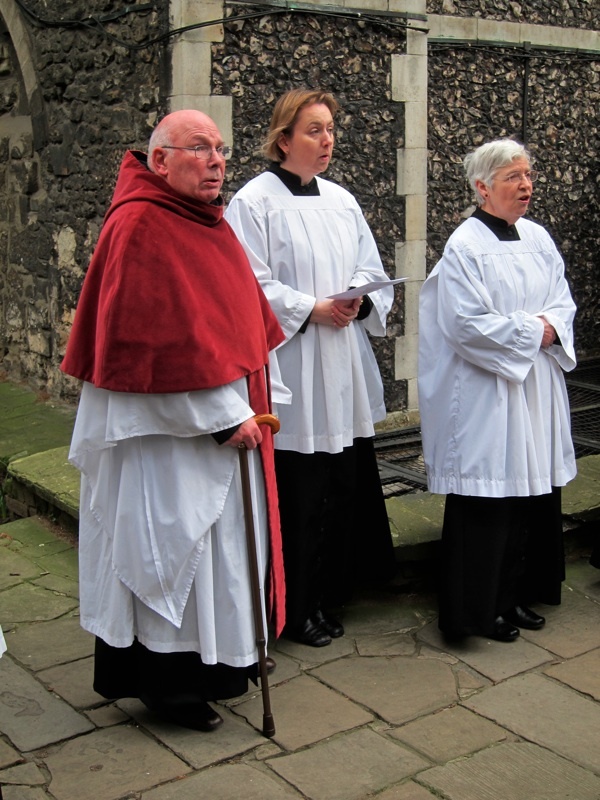 “And now, because there is no such thing as free buns,” he announced, “we’re going to sing a hymn.” Yet we were more than happy to oblige, standing replete with buns on Good Friday morning, and enjoying the first sunlight we had seen in a week. 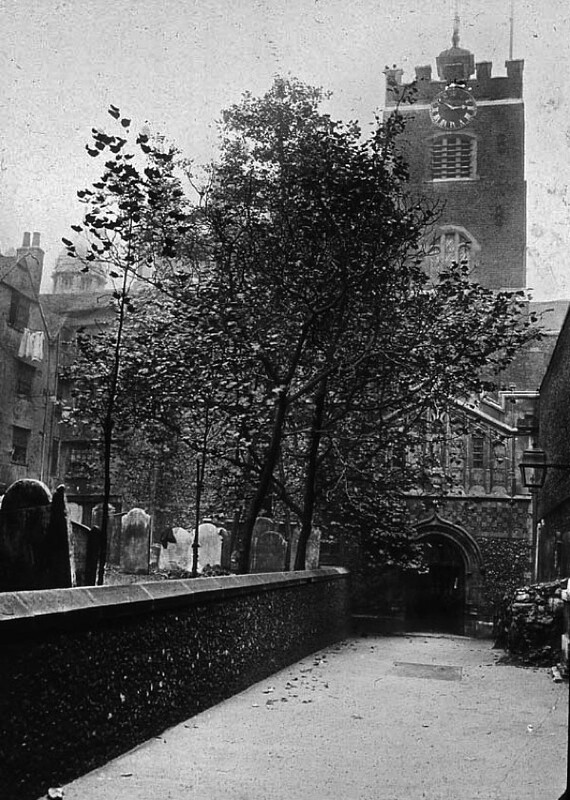 The Priory Church of St Bartholomew the Great, a century ago. 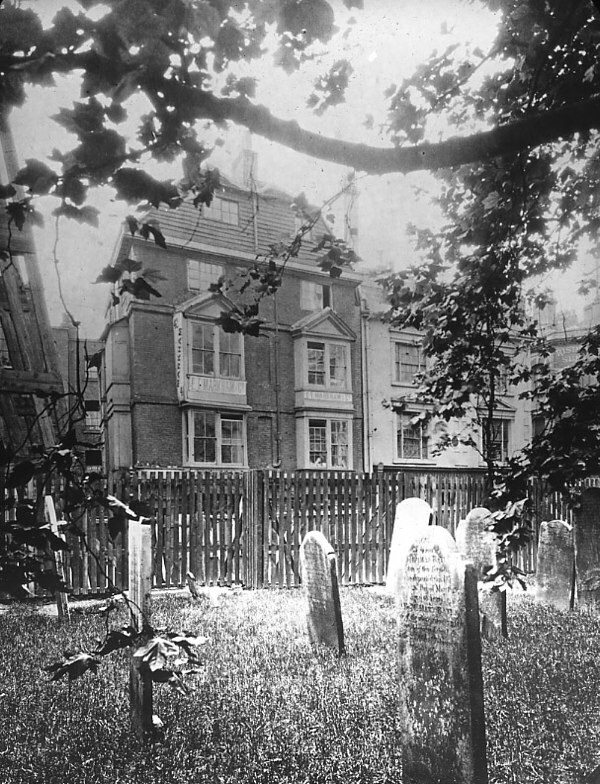 John Betjeman once lived in this house overlooking the churchyard. 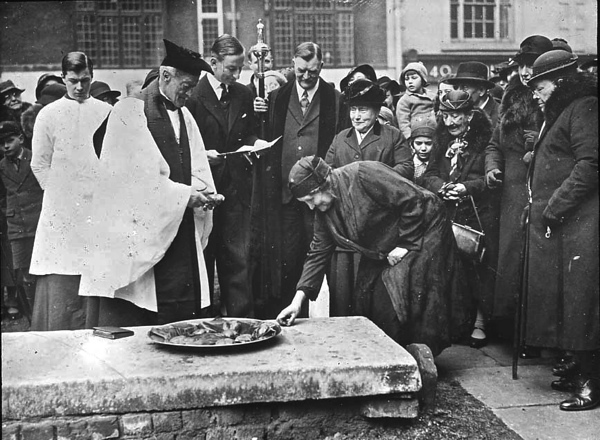 The ceremony of the Widow’s Sixpence in the nineteen twenties. 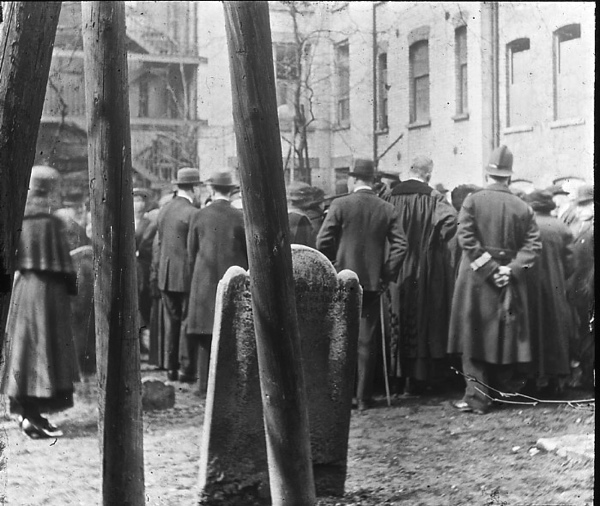 A crowd gathers for the ceremony a hundred years ago. Hungry widows line up for buns. 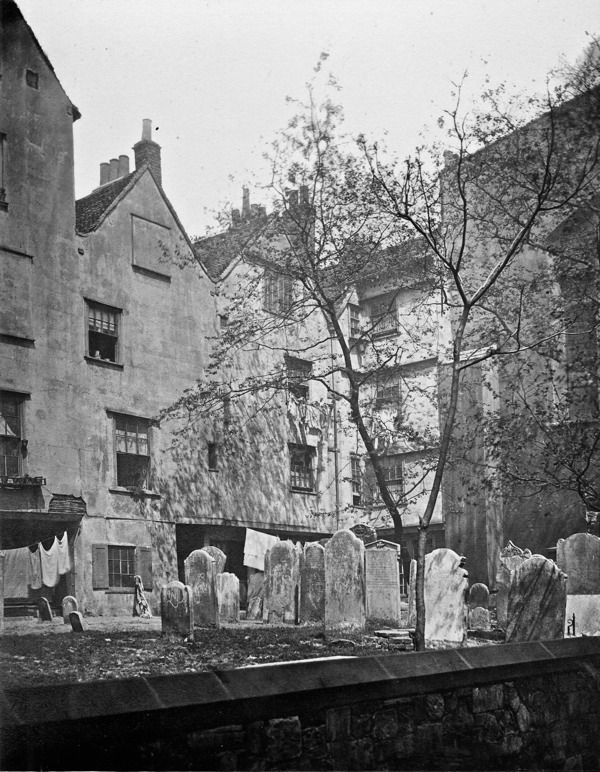 The churchyard in the nineteenth century. 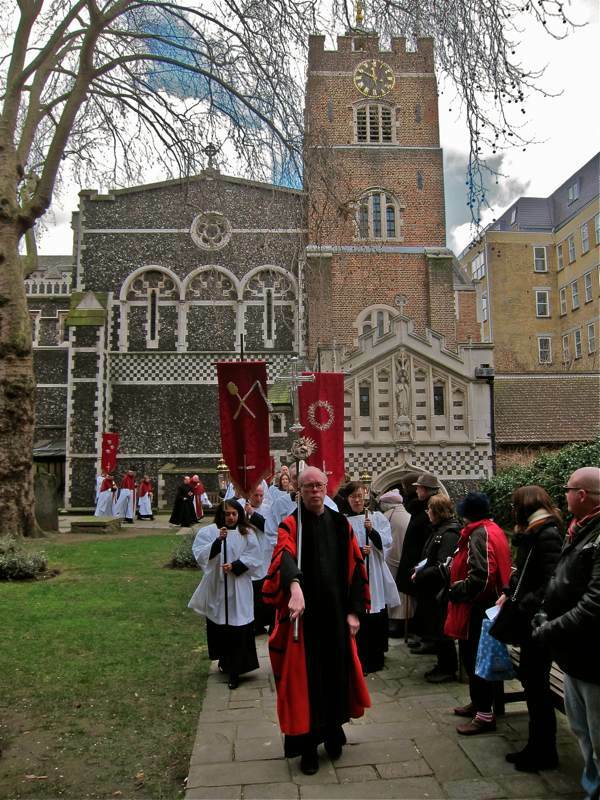 Rev Martin Dudley BD MSc MTh PhD FSA FRHistS AKC is the 25th Rector since the Reformation. 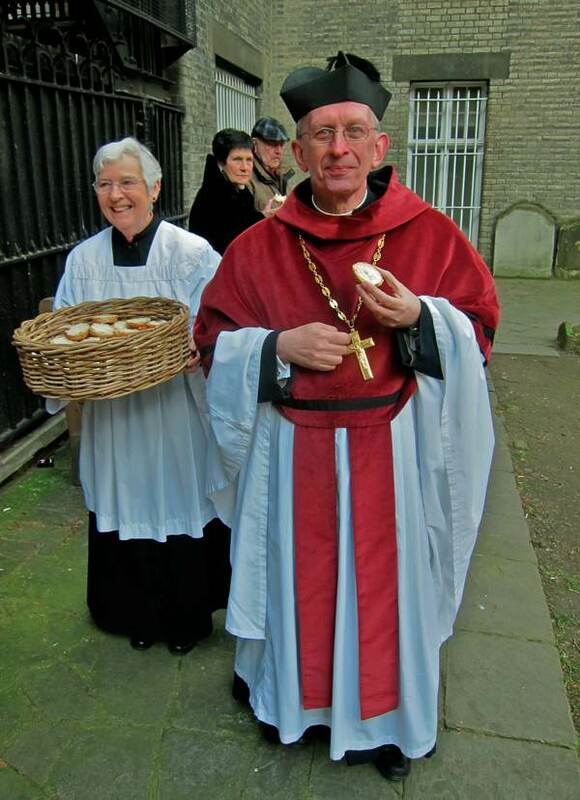 The clerics ensure no buns go to waste. 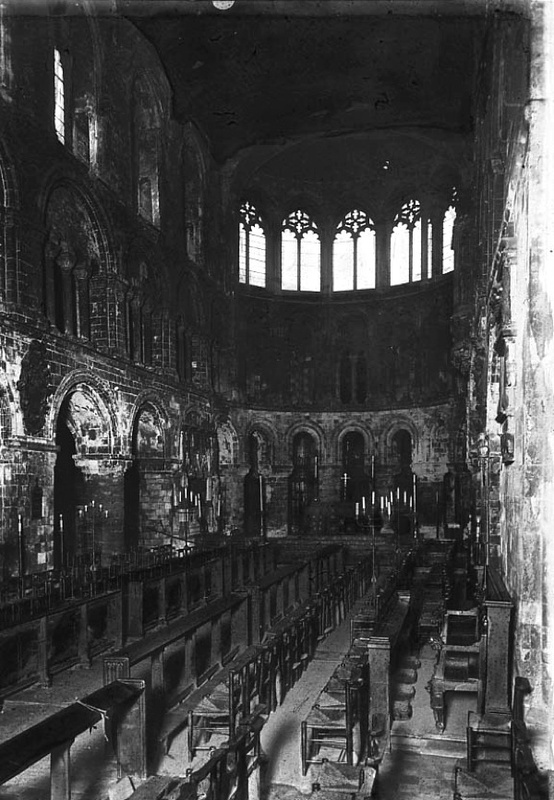 The Norman interior of St Bartholomew the Great at the beginning of the twentieth century. The Gatehouse prior to bombing in World War I and reconstruction. Great to know more about this lovely church. 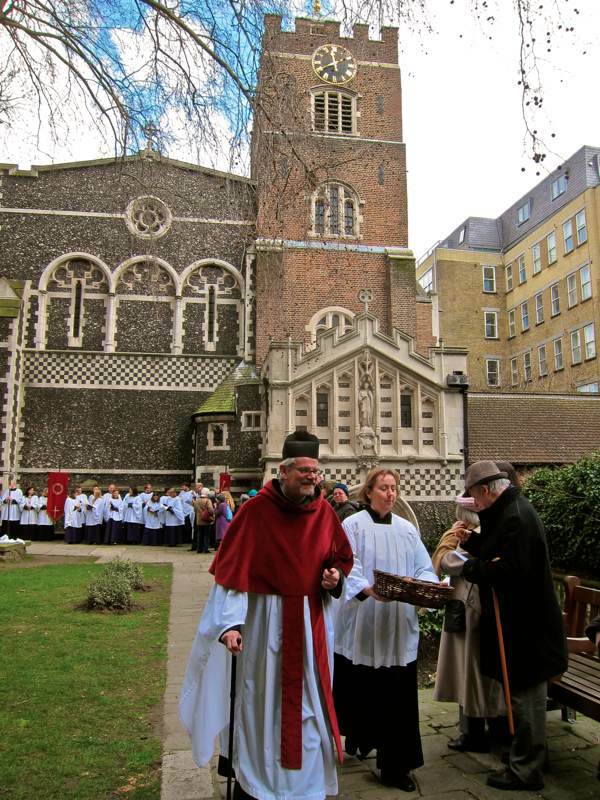 We’ve pottered around in the churchyard before. And what a great ceremony. And good for the lady who spoke up for 20 shillings. Not that 20 shillings takes you very far! Enjoyed this very much, especially hearing about John Betjeman. And seeing ‘proper’ hot cross buns, unavailable here in the States! Rev. Dudley has a lot of alphabet soup after his name – what does it all mean? Since I could not be there this Good Friday I baked my own hot cross buns. It’s a lovely custom.